BEST PRICE in Treasure Island for a WATERFRONT CONDO! $199,900! A hidden gem located on the desirable Paradise Island in Treasure Island. 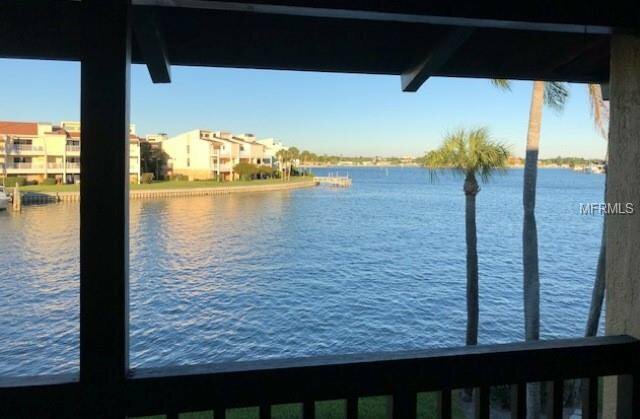 Come, take in the amazing water views of Boca Ciega Bay and the Intracoastal waterway! La Costa Brava is a wonderful waterfront condo community offering the best of Florida living! Launch your kayak or paddleboard off the community dock, fish from there or get picked up by your boating friends for a day on the water. The centrally located community pool is on the water as well and offers a large patio area, lounge chairs and patio tables with grilling area. Docks available for annual rental from HOA. This spacious 2 bedroom condo is a second floor unit with vaulted ceilings and large balcony overlooking the water. Great floor plan with ample living/dining rooms, large master bedroom with walk in closet, ceiling fans throughout, storage in attic and full size stack-able washer and dryer. Watch the boat parade, beach is less than a mile away, about a 9 minute bike ride, Treasure bay Golf and Tennis is next door, close to shopping, downtown St Pete, TIA, John's Pass and more! See this condo today! Listing courtesy of REALEAN EVOLVE REAL ESTATE. Selling Office: REALEAN EVOLVE REAL ESTATE.